Giles Everard, Dutch physician, 16th century. 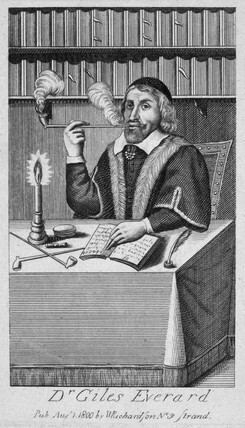 Engraving of Everard, or Gilles Everaerts in Dutch, (active 1580) who wrote works on the medicinal uses of tobacco smoking. He suggested that its benefits were such that there would be much les need for physicians. 'It is no great friend to physicians, though it be a physical plant; for the very smoke of it is held to be a great antidote against all venome and pestilential diseases.' Illustration copied from the frontispiece to the English translation of his 'Panacea; or the universal medicine, being a discovery of the wonderfull vertues of tobacco', 1659, (first published in Latin in 1587) for a new edition by W Richardson, published in 1800.